Tracy Sims has held the position of lead medic for only two years now, but has been able to do so much in that short amount of time. Tracy quickly became a problem-solver and was recently promoted to Field Training Officer in November of 2016. 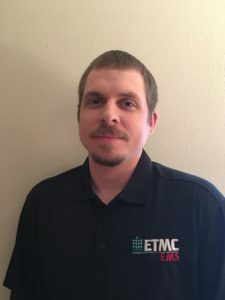 Tracy has taken his passion for helping others and used his skills to help new employees that are struggling with becoming a lead medic in our organization. Tracy takes time to recognize weakness and has mastered the art of connecting with new employees on a personal level to explain deficiencies in a way that quickly leads to a resolution. Tracy has always led by example and never shies away from a challenge. His eagerness to provide patient care and help others has been a great example for others to follow. The impact Tracy has on his community is measured not only by those he has helped but also by all those that he has trained.